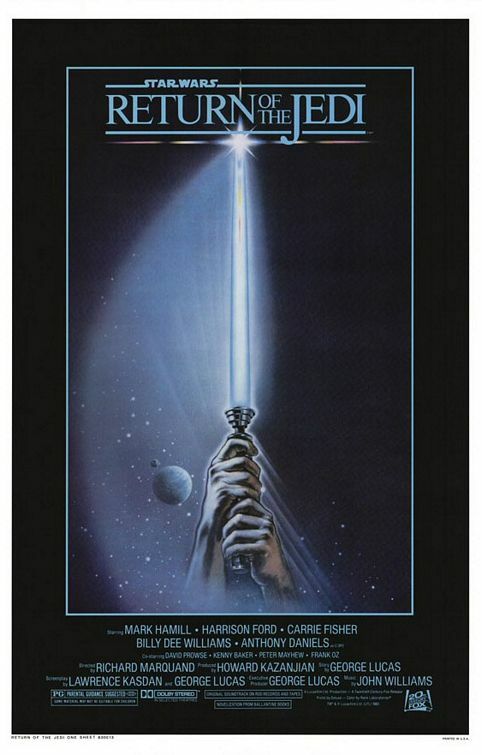 Star Wars: Episode VI – Return of the Jedi – Did You See That One? With the Rebels gaining strength, they seek to destroy the Death Star once more. After rescuing Han Solo (Ford) from Jabba the Hutt’s palace, Luke (Hamill) and Leia (Fisher) return to aid in the pivotal battle. Meanwhile, Darth Vader (James Earl Jones) and the Emperor (McDiarmid) seek an opportunity to bring Luke to the Dark Side. As the Rebel’s prepare for their attack, Luke makes one last effort to save his father. In the third and final film from the original Star Wars trilogy, the Rebels and the Empire face off for one final epic battle. This time Richard Marquand (Jagged Edge) took the helm as director. The screenplay was based on the story by George Lucas (Indiana Jones and the Last Crusade). Alongside Lawrence Kasdan (Raiders of the Lost Ark), Lucas also helped to pen the screenplay. The cast brought back all of the familiar faces from the first two films including Harrison Ford (Witness), Mark Hamill (Star Wars: Episode IV – A New Hope), and Carrie Fisher (When Harry Met Sally). The cast also featured the return of Billy Dee Williams (The Lego Movie), Ian McDiarmid (Star Wars: Episode V – The Empire Strikes Back), Alec Guinness (Lawrence of Arabia), James Earl Jones (Field of Dreams), and Frank Oz (The Muppet Christmas Carol). This is a great story that wraps up many of the story arcs started in the first film of the trilogy. The emotional content in this movie exceeds anything done in the previous two films. Lawrence Kasdan and George Lucas did a great job building on the relationship between Luke and Darth Vader. This one also introduces new worlds and new characters, further expanding the universe of the series. The dialogue in this movie is also stronger than the previous films. Each of the characters seems to be more clearly defined as the saga comes to an end. There is little to dislike in this third film, and the story is a great one. The acting in this movie is pretty great. Mark Hamill gave his best performance in the series in this movie. His emotional performance really gives authenticity to the struggle Luke has with his parentage. Harrison Ford is also great in this one. Once again he brings Han Solo’s ego and arrogance to life, but keeps a sense of loyalty built into him as well. Carrie Fisher does a great job with the increasingly more militant Princess Leia, allowing her strength to show throughout this one. The rest of the cast does a great job as well. James Earl Jones and Frank Oz both lent their voices to two of the most iconic characters in the film. Together they gave audiences Darth Vader and Yoda with great performances. Billy Dee Williams and Ian McDiarmid also did a great job with their roles in this one. The rest of the cast also does nice work, bringing this wonderful universe to life. The sound and visuals in this movie were on the cutting edge when this film was released in 1983. The film was nominated for Oscars for Best Set Decoration, Best Sound Recording, and Best Sound Effects. The sound effects gave us the familiar sounds of light sabers and blasters, as well as a number of other memorable sounds. The film was awarded a Special Achievement Academy Award for the work on the visual effects. The film also features a classic score that also earned an Oscar nomination for John Williams. Overall this one has all the pieces that made it an instant classic and a box office winner. This is a great film, and it finishes the saga started in A New Hope wonderfully. If you love these movies, it’s time to watch them again. For anyone who hasn’t seen these films, you’re missing out on some movie magic. I would recommend this to anyone who loves science fiction and drama. I would also suggest this to fans of the stars. I give this one 4.8 out of 5 stars. Thanks for checking out my reviews. Enjoy the saga again soon. It’s worth the time.